I was chomping at the bit waiting for this new era in the world Cass has created. I did my usual ritual of planning out how I would neglect all my duties (#momprobs) and devour this book. 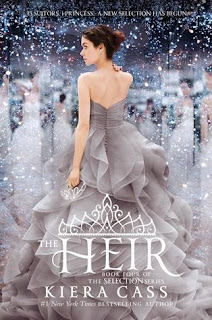 It started out with me eagerly reading, wanting to know what had become of Maxon and America. It was a slow start and immediately I knew that their daughter Eadlyn was nothing like either of them. The best way I can describe her is that she has the personality of Maxon's father with the looks of Maxon's Mother and has a hint of unconditional love (for her family, none for her country) from her mother. I got all the way to the last 30% and stopped reading. Why? Because I freaking felt a #roth AND #mockingjay headed in my direction! Can you flipping imagine anything worse than a beloved series have the crap-tastic tragedy of those two books? Your total fairy tale love affair crumbling combined with the heroine (America) being a completely different (weak and submissive) woman! I did finish the book. I read the last 30% and held out hope. I mean I stalk Kiera Cass on instagram, read all the teasers and have talked this book up to anyone that would listen. Surely she was going to pull the rabbit out of the hat in the end... she did all right but it was a stinky skunk that popped out of that hat! The cliffhanger is something I suspected might happen but thought there was no way she was going to #roth me. No way, no how. WRONG. Now, Eadlyn had a sliver of character growth towards the end and a little hope was redeemed. I am attached to the other Shreave children. They all seemed how I imagined they should be, with very different personalities and strengths. I guess the saying my great-aunts always said about kids is true. "Kids are like pancakes. You screw up the first one but then you get better and the rest turn out all right." It all boils down to the last book. Where is it headed? I still think things can turn around and this still be the epic conclusion we all envisioned. For Eadlyn's bubble life to bust! To see that fiery return of America Singer and Maxon Shreave. A good fight is in order, show those kids what passion is all about. Eadlyn to learn all about her parents selection. And for her to know why her mother isn't crazy about Camille's mother. She needs to know what kind of lengths her mother went to on the wings of jealousy. Explanation how the Shreave kids love and adore their mother's closest friends but have no clue to all the tragedies they suffered and what drew their families together. A novella of May. She is the resurrected Celeste. I think she would be a blast to read about. I want these boys to be narrowed down and more memorable. Some of them that were mentioned I couldn't even remember and had to go back and find where their name was mentioned at the actual selection. I just want more. Like a 500 page conclusion.